In 2009 we convened our first conference to celebrate ourselves, reflect on our past and begin the much-needed process of working together for the future. For some people, just the act of seeing other Butches, Studs, Doms, Aggressives, FtMs in shared space and in conversation was powerful. In a few cases, the event created relationships that would not have existed otherwise and for some folks, coming together again only strengthened them. On more than one occasion, we heard personal accounts from attendees about how coming to BUTCH Voices had changed their life. In 2010 we took a chance when, as a young organization, we embarked upon a set of regional events, hoping to reach out to more people. We touched down on both coasts, and in Texas. We continued conversations about identity, working to understand and celebrate our differences, challenges we face and triumphs we honor. The response was amazing. We know that you are a part of this effort because you too sense the potential for things to happen when we come together. That potential, combined with your commitment helped us continue to learn and grow. 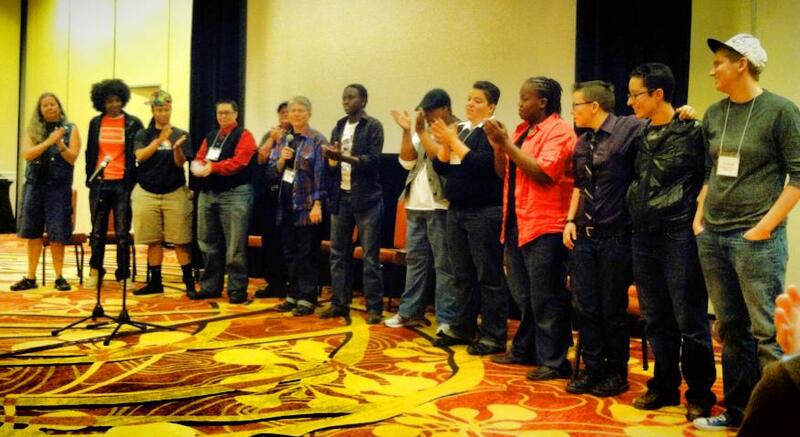 In 2013 we held our third national conference again in Oakland, CA. Our theme was “Conversations Build Communities.” There was so much love and vulnerability created that we shared with one another. We created spaces that were not possible for many of us elsewhere; spaces that many of us are missing and need right now. All of us moving beyond the ‘butch nod’ to interact, use our voices, and invest further in building community together. Faced with the task of deciding whether we would be able to plan an effective 2015 National Conference, the board decided that it was better to take time off. We needed to retool and return as a more effective organization. So we took some time off, and in 2016 refreshed our website and started to engage in some of the conversations that are impacting our communities. In 2017 we held our National Conference in Oakland again with the theme: Reconnect. Recharge. Resist. Next Steps for 2019. That’s where you come in. We are an organization that was created to serve the Masculine of Center (MOC) community. We are proud of the conversations we started, and the community that we have all built together. Now, we need to ask our community for just a few things so that we can celebrate TEN YEARS of BUTCH Voices. From donating directly to BUTCH Voices, to helping with fundraisers and events in your area, to volunteering at the conference. We need you! Check out the various ways to Get Involved. We look forward to seeing you (again) in Oakland!